After speculative reports of slow sales, iPhone X is now said to be in the "high end of the industry range"
Just one week after delivering a widely-distributed report speculatively suggesting that 'weak demand' might result in Apple canceling production of iPhone X this summer, analysts are now lining up to shift their stories in the days before Apple releases its actual fiscal Q1 performance data for the winter quarter. In a remarkable turn, iPhone X is suddenly said to be selling well, and scuttlebutt about slashed component orders is again looking uninformed. Last week, analyst Ming-Chi Kuo made waves based on a channel-checks note which speculated about iPhone quarterly sales through the end of 2018, far in advance of any guidance Apple provides. Loosely based on his comments, bloggers struggled to determine the most violent word to capitalize in headlines portraying iPhone X as troubled and nearing a brutal execution. Writing for Tom's Guide, Henry T. Casey posted "Apple to Axe Current iPhone X After Slow Sales," claiming "the clock may be ticking on the current version of Apple's notch-bearing iPhone X." The article stated that "disappointing demand for the smartphone will drive Apple to discontinue this 5.8-inch device, when a new, larger iPhone X Plus (among others) takes its place." It was sourced as a paraphrase of the AppleInsider report actually written from the original Kuo note. Mainstream news reports portrayed iPhone X's fate as "maybe" even worse than that. 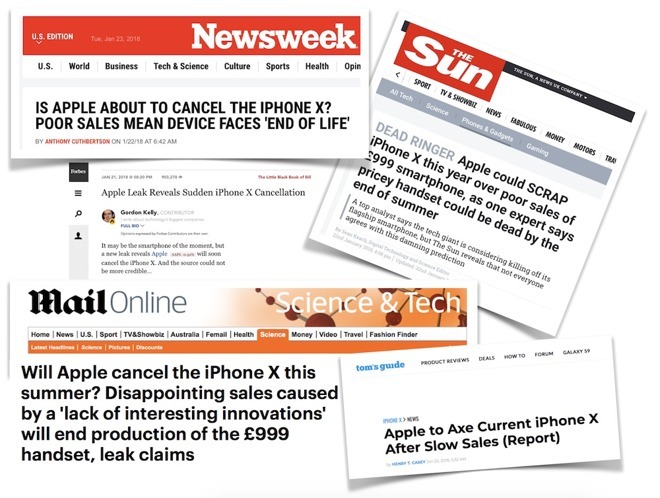 Yesterday, Newsweek posted a headline by Anthony Cuthbertson rhetorically asking, "IS APPLE ABOUT TO CANCEL THE IPHONE X? POOR SALES MEAN DEVICE FACES 'END OF LIFE.'" The tabloid press got even more creative with its capitalization and repetitive use of exaggerated language to enliven the interpretation of a now week-old idea: "DEAD RINGER. Apple could SCRAP iPhone X this year over poor sales of 999 smartphone, as one expert says pricey handset could be dead by the end of summer" wrote Sean Keach, the "Digital Technology and Science Editor" of UK's The Sun. And that was just the headline. Gordon Kelly, a contributor for Forbes similarly intoned "Apple Leak Reveals Sudden iPhone X Cancellation," upgrading the Kuo note from analyst thoughts to leaked facts directly from Apple. Like every other report on the subject, Kuo is described as a source that "could not be more credible." The UK's Daily Mail decided to ask its readers if they knew anything about the "leak," adding that the reason for something possibly happening is definitely the design of the iPhone and its TrueDepth sensor, and also, at the same time, a "lack of innovation." Phoebe Weston was credited for writing the article "Will Apple cancel the iPhone X this summer? Disappointing sales caused by a 'lack of interesting innovations' will end production of the 999 handset, leak claims." After describing iPhone X last week as failing to capture buyers' interest, particularly in China and specifically because of its TrueDepth sensor notch, Kuo is now describing iPhone X as "a 'strategic success' for Apple. He noted that iPhone X's innovative depth sensing camera system gives the company a two-year lead over rivals and is cementing long-term competitive advantages with its Face ID and TrueDepth cameras. "We believe the iPhone X has established a long-term edge for Apple," Kuo stated, a wildly different direction from the last weeks' reporting that just portrayed his previous note as decrying a "lack of interesting innovations." Kuo (as of this week) isn't alone in expressing a positive impression of iPhone X and its impact on iPhone sales and Apple performance. Ryan Reith of IDC today tweeted that "[calendar] Q4 results for Apple are strong, especially iPhone (and lesser extent iPad). iPhone X hit numbers at the high end of the industry range." Even The Sun had to admit, at the end of its "DEAD RINGER" article, that "predictions of the iPhone X being culled this year are probably false." It then cited Analyst Daniel Ives of GBH Insights, who told the publication, "we believe the worries around iPhone X demand have been greatly exaggerated." Consumer Intelligence Research Partners, based on a survey of 500 iPhone users between October and December, found that "only" 20 percent had upgraded to iPhone X, besting the installed base of iPhone 8 Plus (at 17 percent), but not exceeding the number who had iPhone 8 (24 percent). iPhone X also exceeded sales of the now very attractively priced iPhone 7, and the collective sales of all entry-level iPhone 6, 6 Plus and SE models. This occurred despite iPhone X only becoming available in November, five weeks after iPhone 8 and other models went on sale. The shift in reporting from iPhone being slated for death to iPhone X sales being at the top of Apple's phone mix as well as at the "high end of the industry range" comes as Apple nears its official report of sales in the holiday quarter. Apple has scheduled an earnings conference call for Thursday, February 1. While the company never breaks down sales of individual models, its earnings information will provide better insight into the company's performance based on metrics including average selling prices, given that both iPhone 8 models and iPhone X are priced higher than previous new iPhone introductions.